Office units available in this popular business park situated in Warrington, consisting of a single storey warehouse unit with a WC and kitchen and several office units all with free parking available. A number of large industrial units available at this popular business park with offices to the front and loading bays opening to a large yard suitable for vehicle or goods storage. The property also has a fuel storage and pumping facility, ideal for companies with their own transport fleet with parking spaces available. 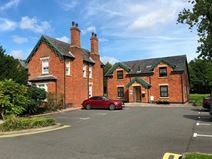 Situated within walking distance to the village of Culcheth which has a large number of restaurants, cafés, delis and shops. Also close to A580, M6, M56 and M62.